Family Archives - Hello, Kristina! Joe and I have officially been married for almost four months now, which is amazing on two counts: 1. because that feels like a super long time and I still feel so happy and lucky and 2. because there were days I told Joe we were only doing some of our ridiculous wedding ideas so that I could write a blog post about it all later. 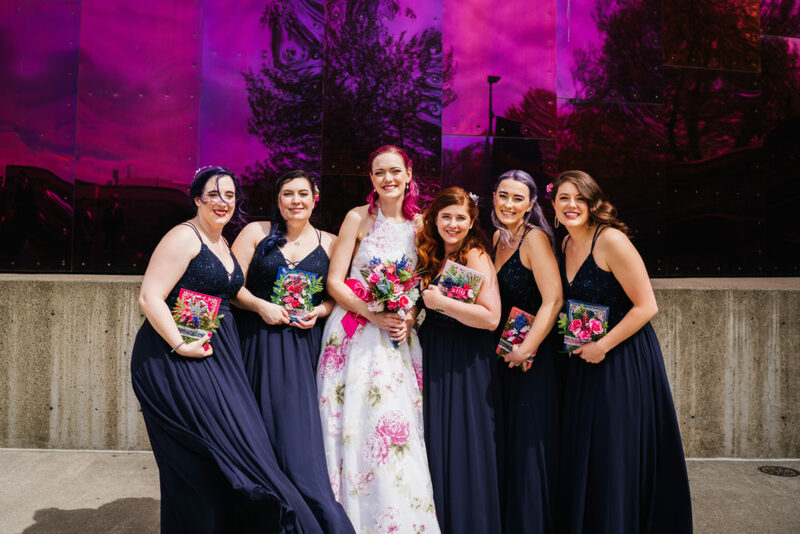 The fact that I haven’t done it yet astonishes me, but on the other hand, I was so thrilled to be done with the wedding that it’s been hard to do literally anything else related to it. Time and space have finally given me the energy I needed to put this together. 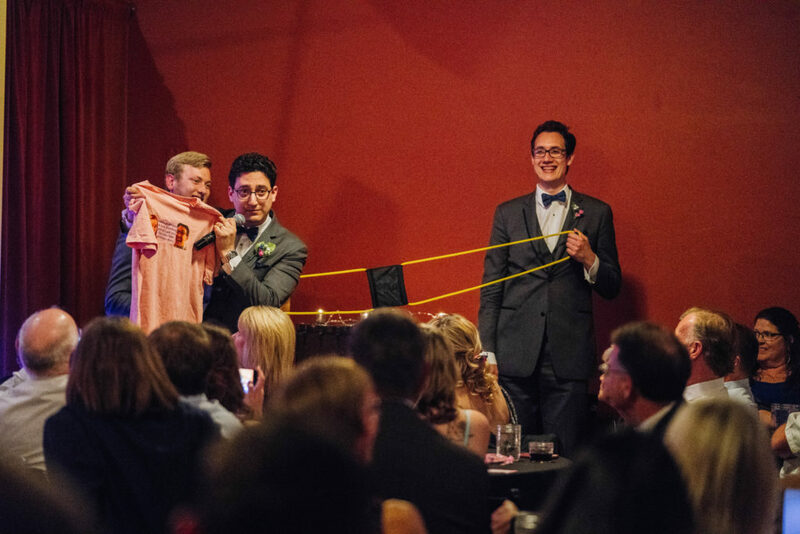 Because if I’m being honest – we put on a damn cool wedding, and I literally can’t wait to see people’s reactions. I guess I’ll try to go in order. 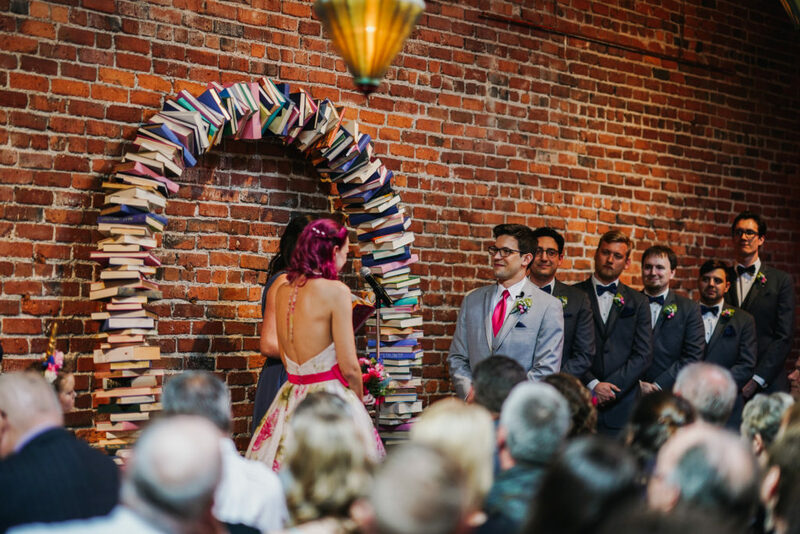 The very, very first thing that inspired this wedding was my insane desire to have a book arch. You know that standard floral arch people often get married under? Yeah. 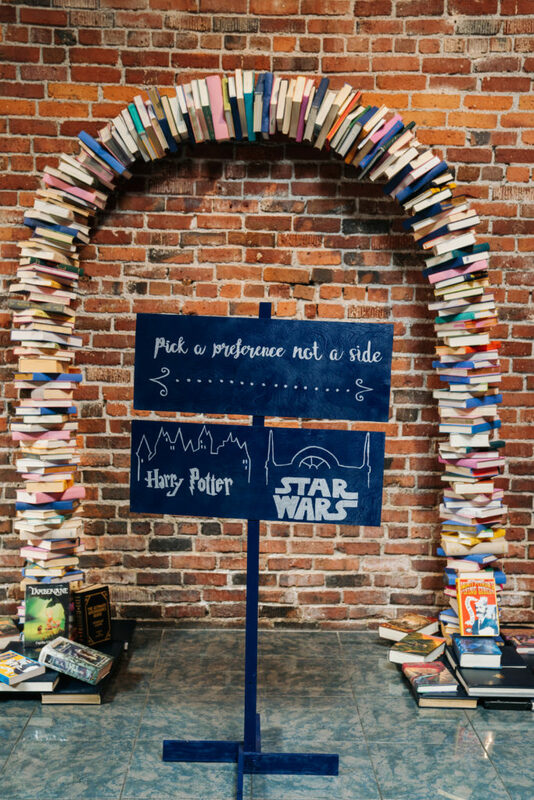 I wanted mine to be made out of actual, literal books. I’m not high maintenance at all, guys. 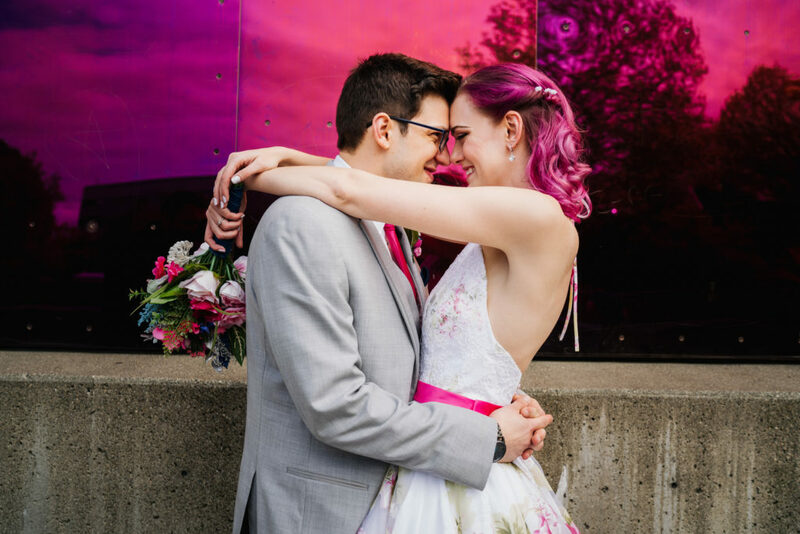 Joe’s dad was a saint and took it upon himself to make this dream a reality for me, and that jumpstarted us into hyperdrive for the rest of our wedding’s theme. The second thing that was purchased was my dress. 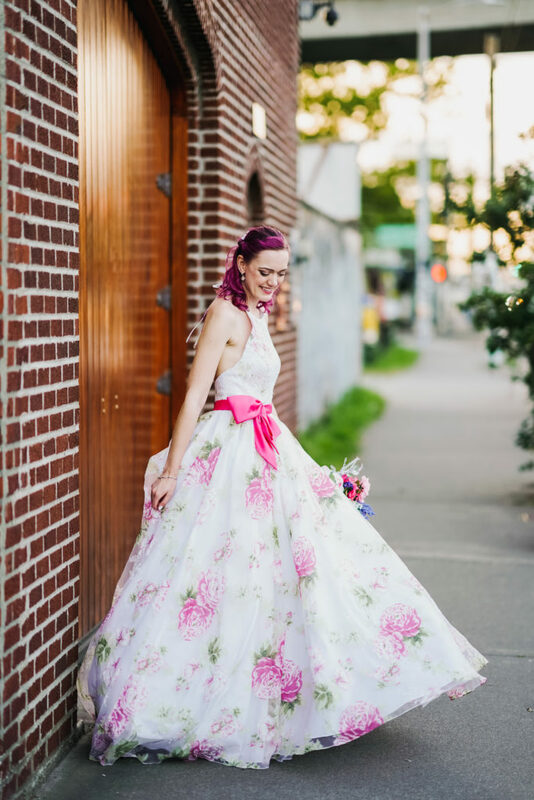 I struggled with my initial wedding dress search because I really didn’t know what I wanted. “Something that doesn’t actually look too much like a wedding dress,” I would say to baffled shop owners as I perused their endless racks of vaguely different white gowns. “Maybe something that makes me look like a wood nymph,” I said a few times, not even really knowing myself what that meant. “Sparkly?” I’d compromise, when my fitting attendant would start to look exasperated. Everyone always says that like, time will stop, and everyone will forget to breathe as a collective gasp encircles the planet, and I’ll be honest — I thought everyone was being a bit silly about ~the magic of dress shopping~. I tried on some nice dresses. I had a few options that I “could get married in, I guess”. So we bought it. I didn’t try on a single other dress. And then we lost it, because Alfred Angelo is the worst and went out of business without warning anyone, bailing on thousands of orders. But – then we found another one just like it online from a second-hand dress shop. But that’s a story for another time. 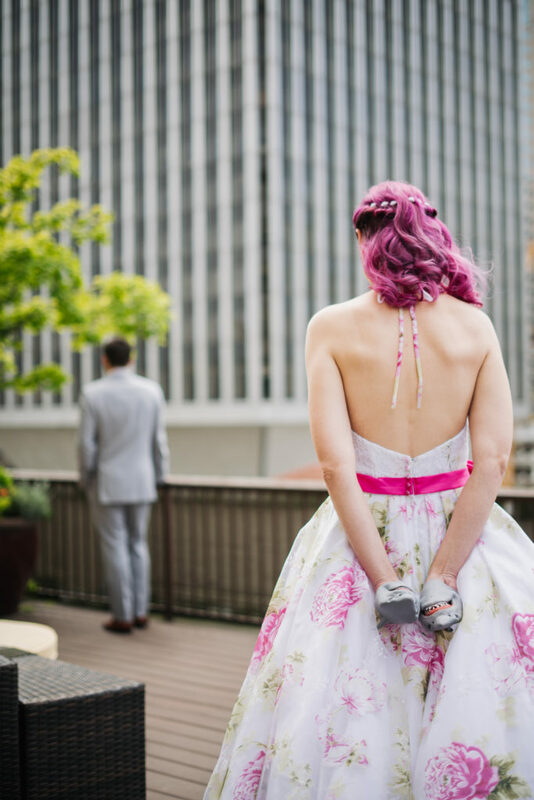 Joe and I started our wedding day out with a ‘first look’ on the balcony of our suite in the Washington Athletic Club. 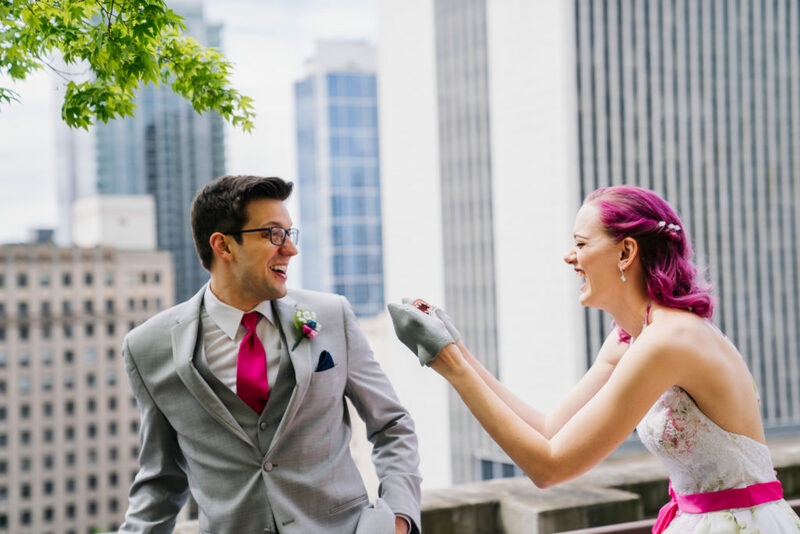 It was a beautiful, elegant spot for us to capture this special moment, and oh yeah — I wore shark hands. There’s a bit of backstory here, but I’ll shorten it just enough to say: the night before the wedding, Joe mentioned that with less than 24 hours to go before saying “I do”, the only thing that could possibly still be a dealbreaker would be if he found out I had sharks for hands. 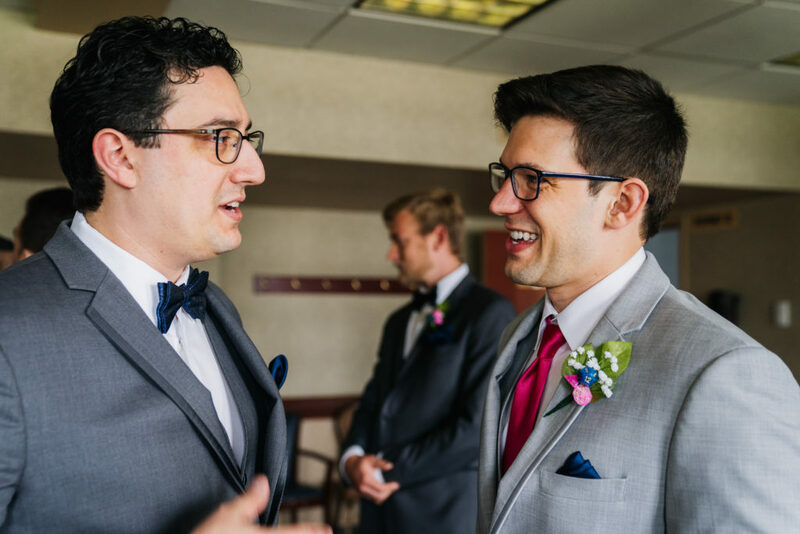 When it came to planning this wedding, I wanted to do something that really and truly represented Joe and I as a couple, highlighting the things we each love — but moreso the things we love together. It took a fair amount of ideating, and many Pinterest boards, but we landed on books (me) and role-playing games (him). The cross section of that was our shared love of escape rooms, which I’ll come back to later. 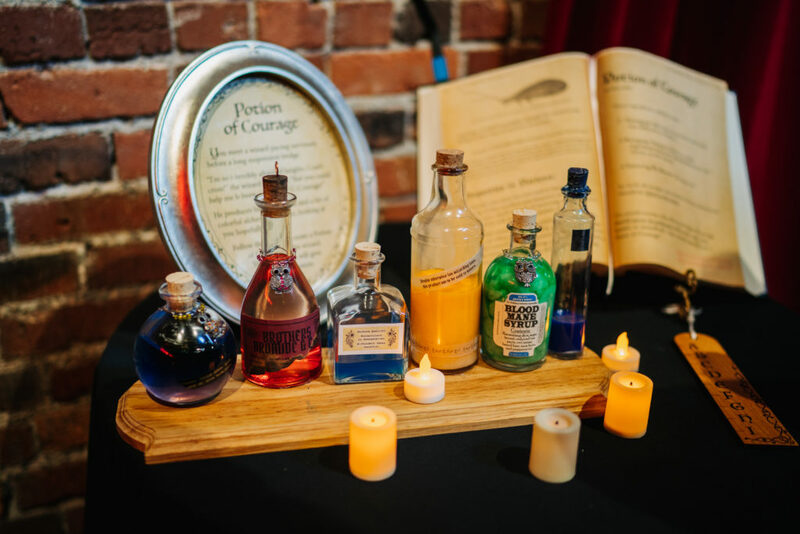 The whole thing combined nicely into a larger “storytelling” theme, which was subtle and yet represented in every nook and cranny of the event, if that makes any sense at all. First I’ll talk about the books. We incorporated them everywhere. 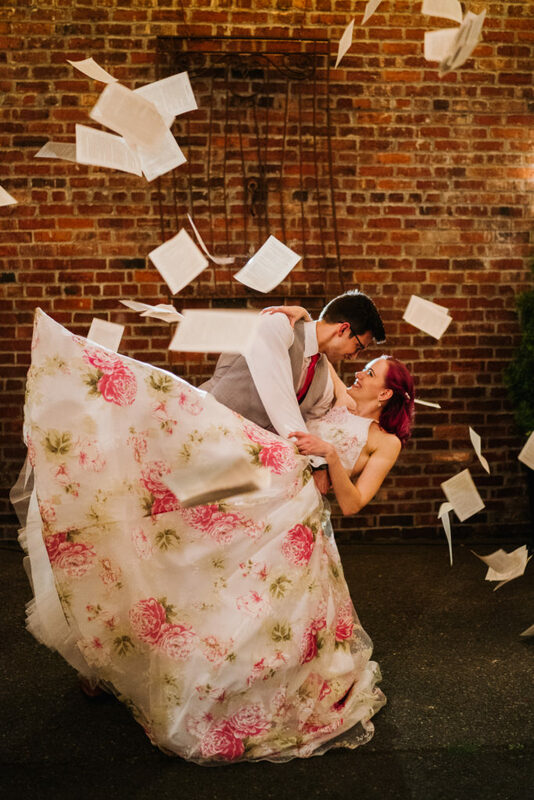 It started with our invitations, which looked like little novels. 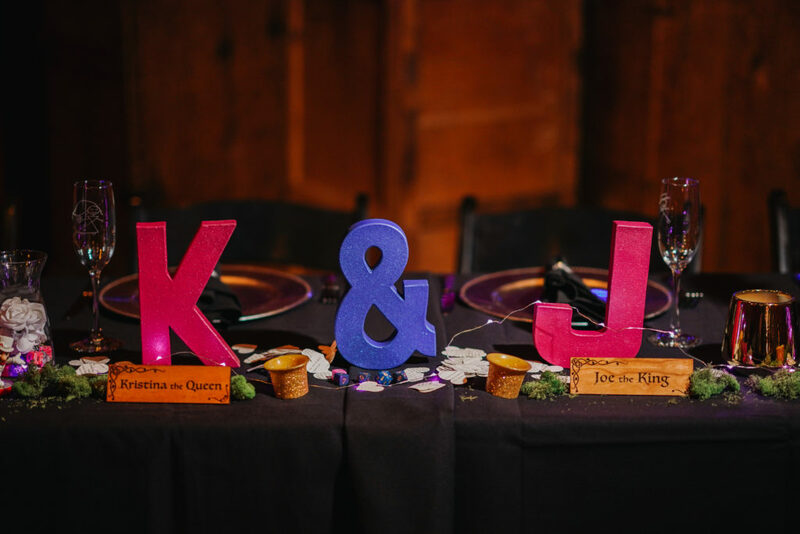 These were designed by the same lovely person who designed my website theme – she designed many elements of our wedding! We had to hand cut those edges, people. The dedication started from day one. 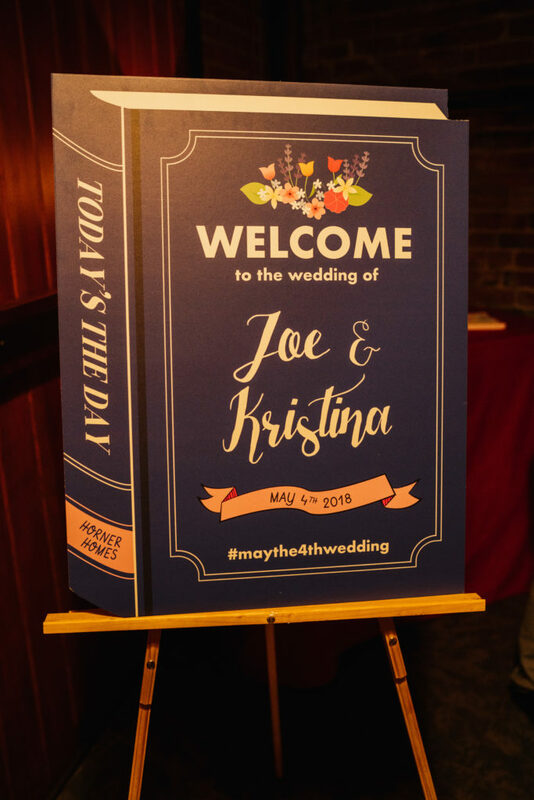 Then, in keeping with the theme, the very first thing guests saw upon entering the venue was this large book sign, welcoming them inside. They were not invited to sign a guestbook, because guest books are boring and who goes back and reads them, honestly? 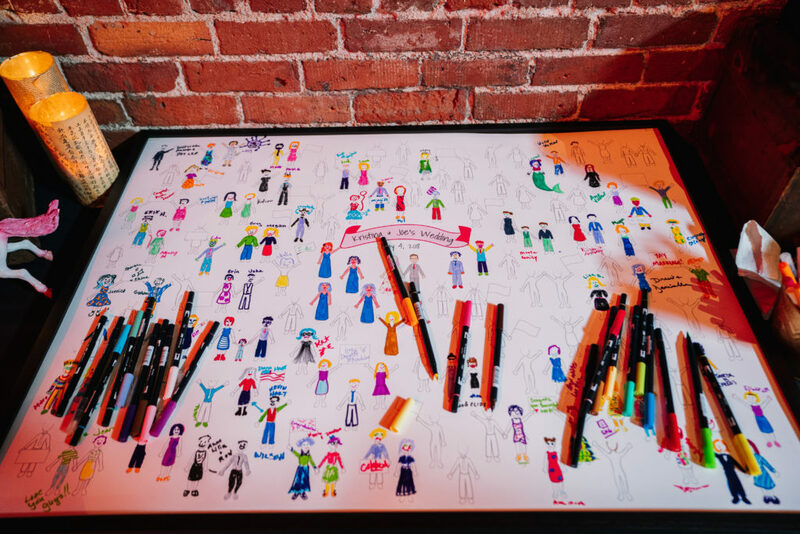 Instead, we instructed guests to choose a figure on this giant framed picture, and color it in to look like them. They were now characters in our story. 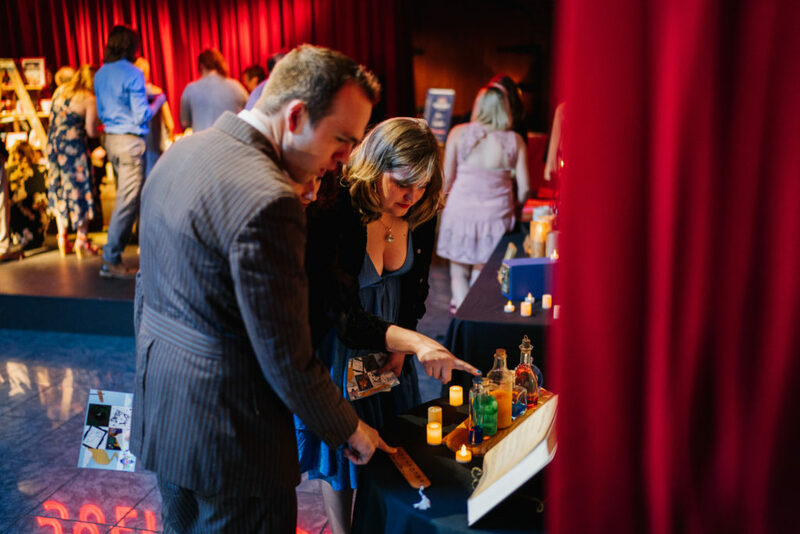 We kept our guests busy before the ceremony with trivia we had included on the back of our programs. In hindsight, programs were one of those things I probably didn’t need to spend the money on, but how cute were they? 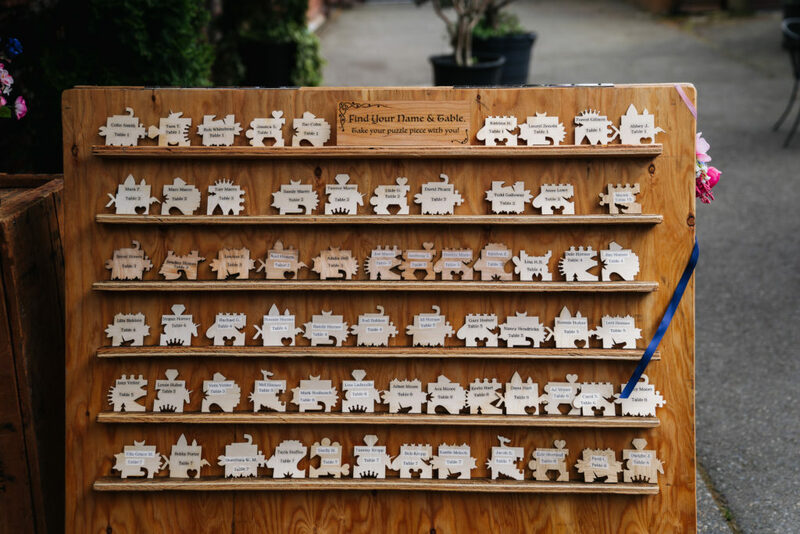 And of course, when they went to choose a seat… there was no bride or groom side. We had our guests make a much more important choice. I bought a heart-shaped paper-puncher and cut literally thousands of hearts from book pages, which we scattered all over the place. 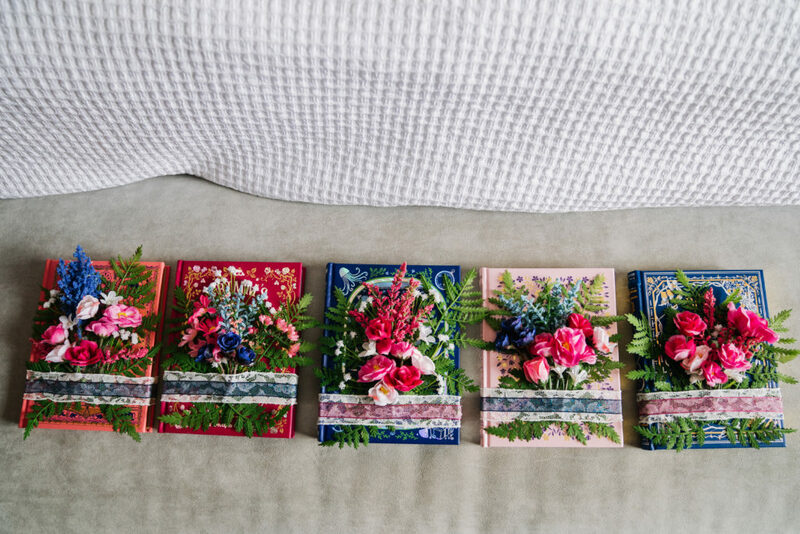 I had zero interest in paying for live flowers, so my bridesmaids carried “book-quets” instead, made out of beautiful classic books I purchased from Barnes and Noble. Any flowers you do see are fake ones I bought on sale at Jo-Ann and hot glued just about everywhere. 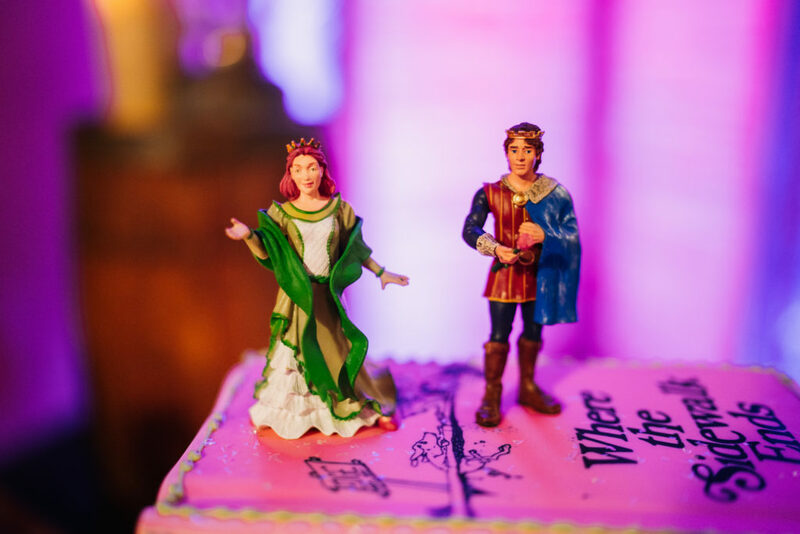 We had a number of desserts available, including the above cake, which included cake toppers that were little medieval versions of us painted by one of our bridesmaids. 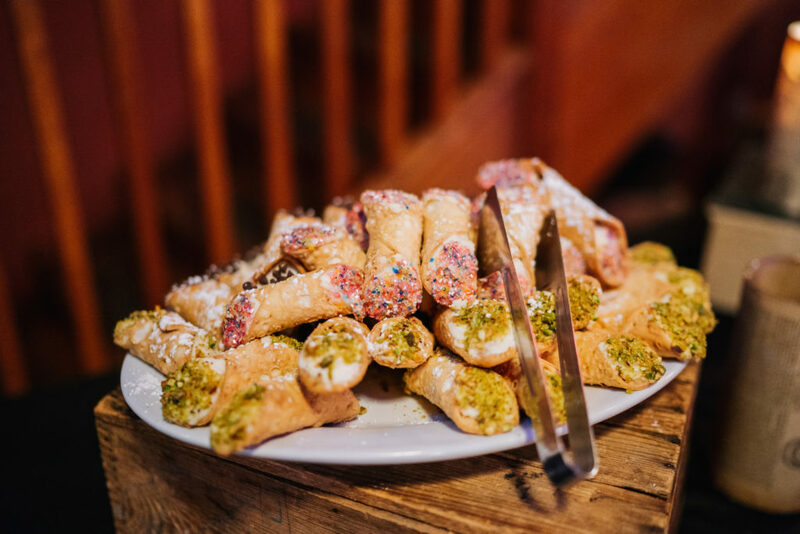 We also had cannoli baked by Joe’s mother, which, unbeknownst to me, were unicorn-themed. Next up was Joe’s inspiration. 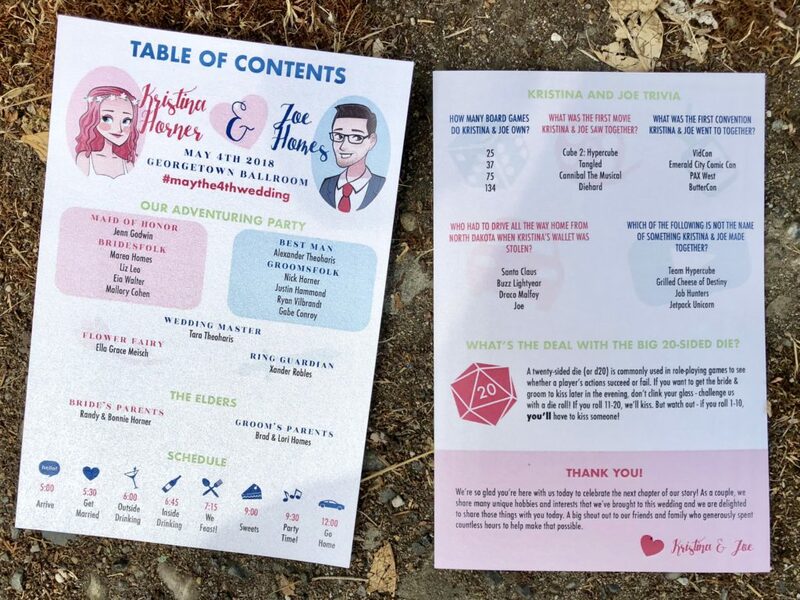 I’m almost more proud of the role-playing game elements of the wedding to be honest, because it’s all just so, so fun. 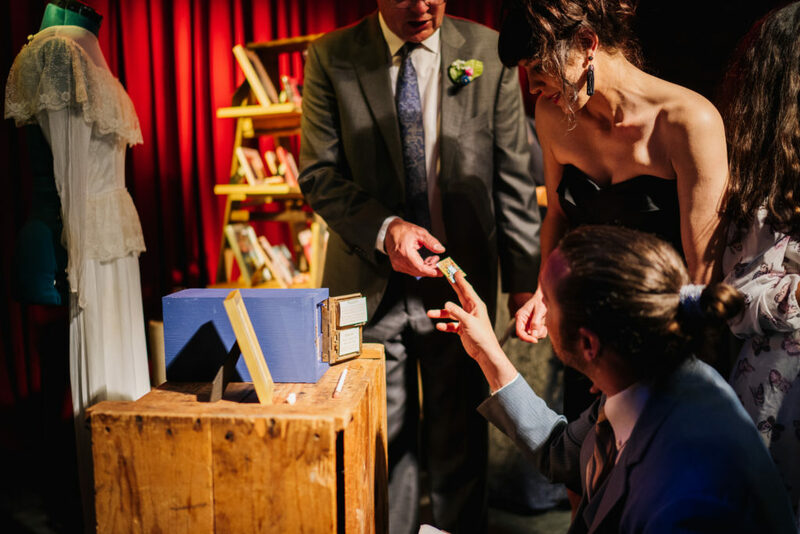 My favorite bit was the boutonnières, which we made out of gaming dice. Honestly, out of everything at the entire wedding, these are the piece I still think about and just smile. 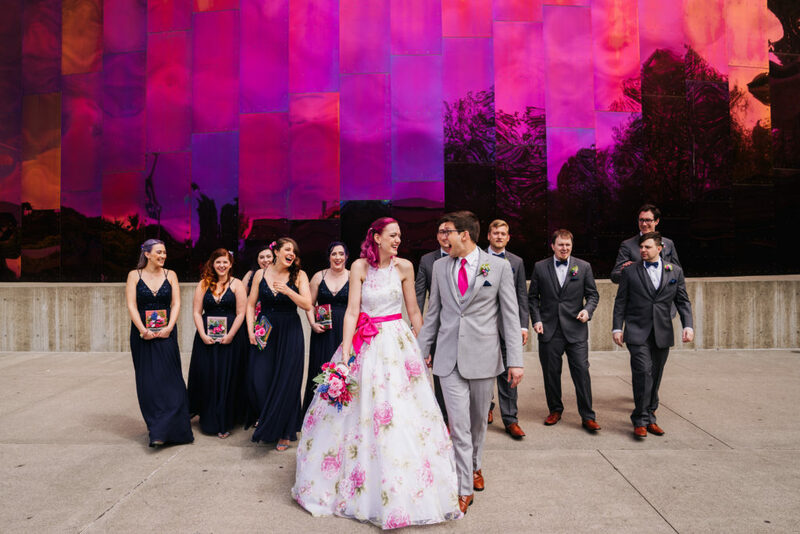 Our wedding was so cool. 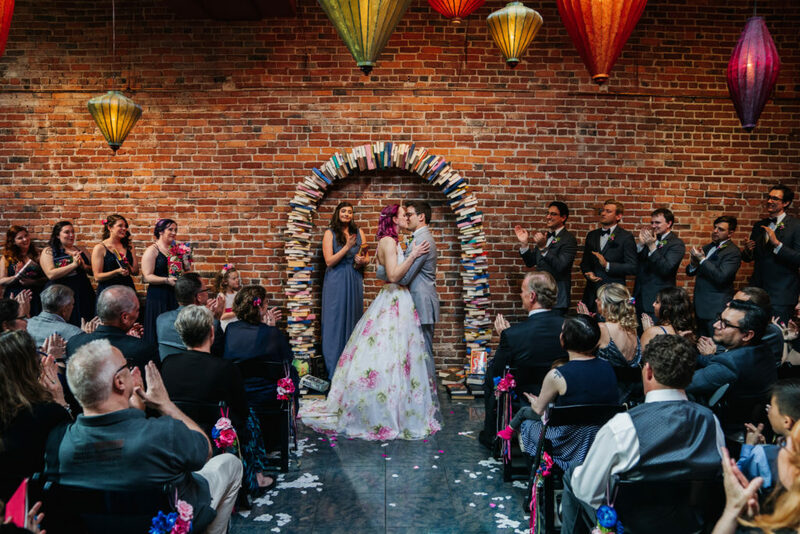 We supplemented the book decor with dice, using large paper ones we’d nicked from a nerdy charity gala months earlier, and actual D20s in our wedding colors that were scattered pretty much everywhere there wasn’t already a paper heart or a book. 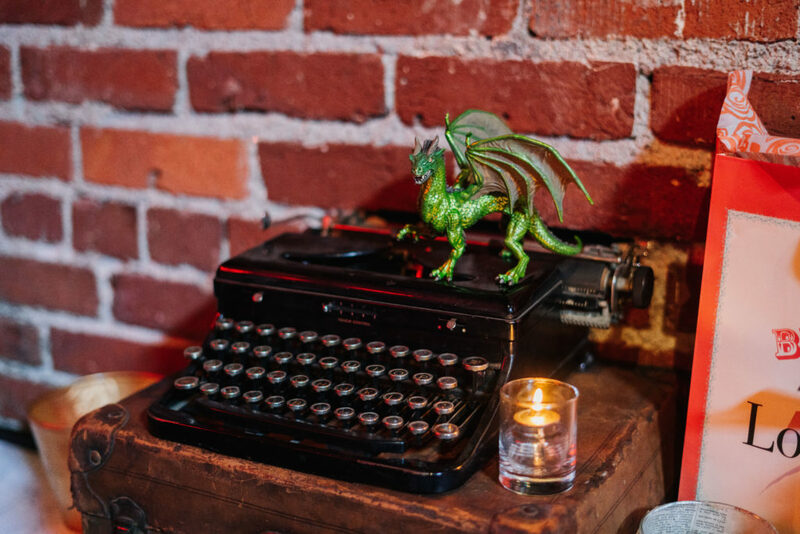 Not to mention the dragons and unicorns we slipped in wherever we could. Because it’s us. 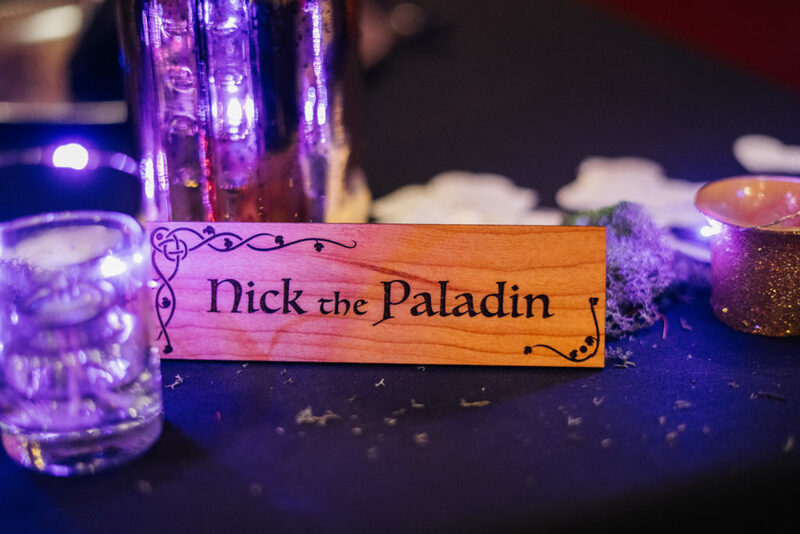 We gave our wedding party different role names, because everything about weddings is so formal and weird and we wanted to fix that. Our officiant was the “Wedding Master”, our parents were the “Elders”. 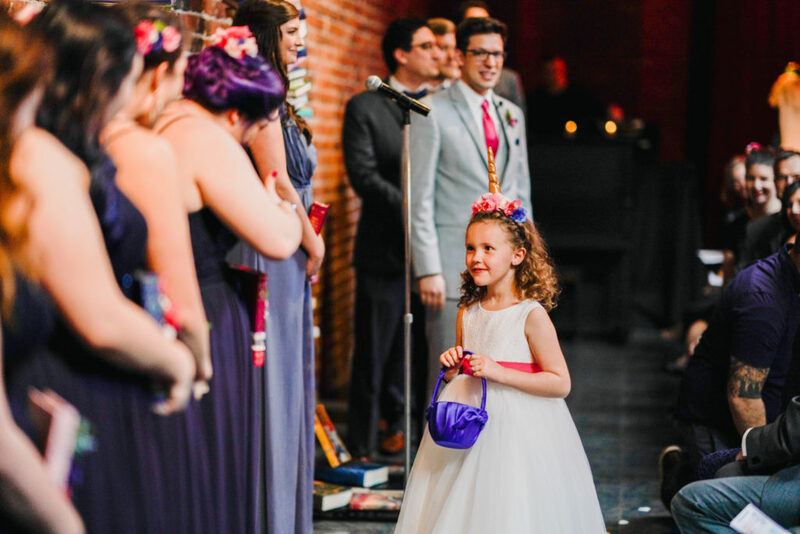 Our flower girl and ring bearer were the “flower fairy and ring guardian” and we treated our wedding party like an actual adventuring party, giving everyone party roles. I gave our flower fairy two options for her headwear. We made her a flower crown, and at the last second, we also made her a unicorn headband. She chose the unicorn headband. She also dropped more of those paper hearts from her little basket instead of flower petals, because obviously. 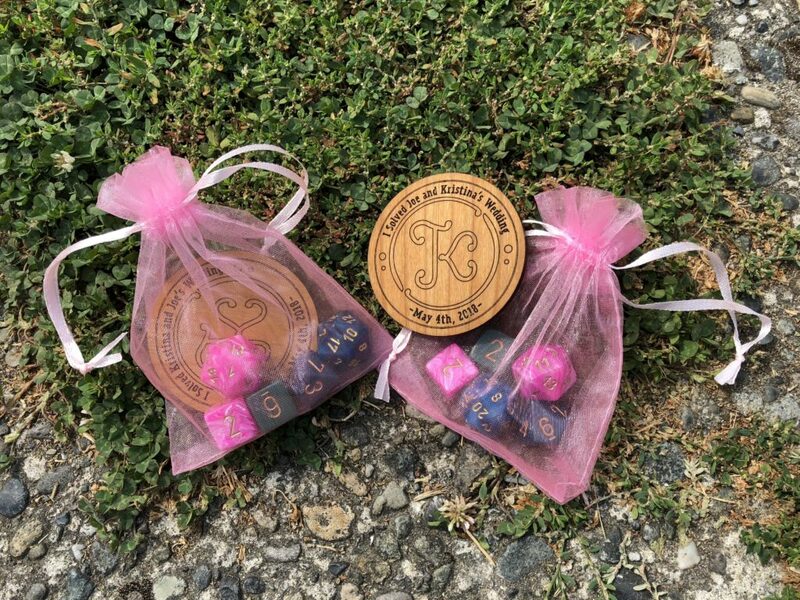 We also veered pretty far from tradition and threw in a few of our own… like rolling for initiative to see who got to say their vows first during the ceremony. 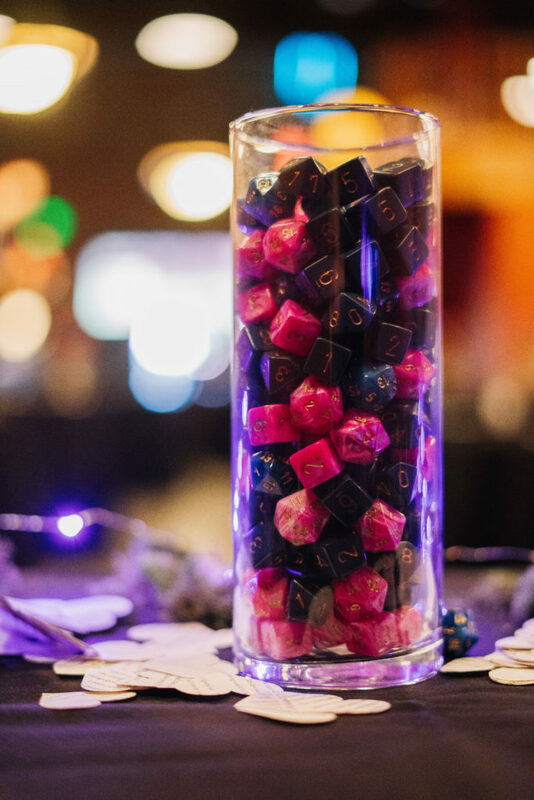 We used a giant D20 in our wedding colors that we had commissioned from on Etsy. 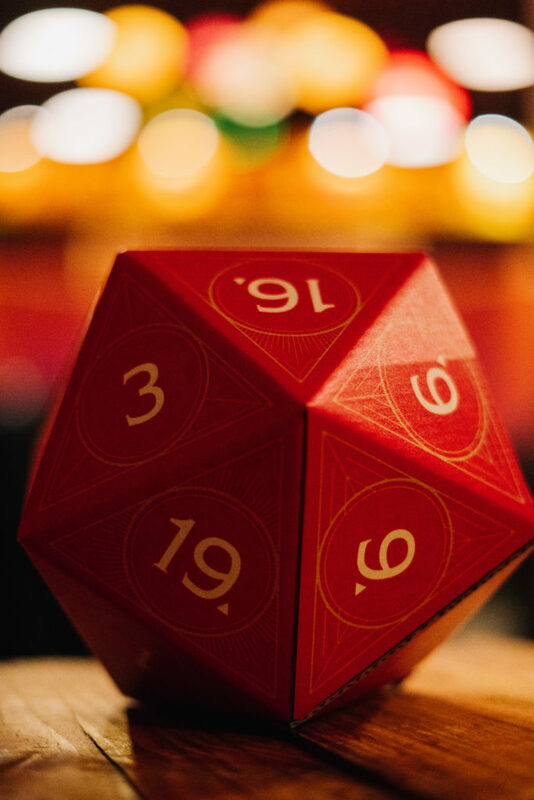 I rolled an 18, beating Joe and setting the tone for our entire marriage. Most people would say this was probably enough. 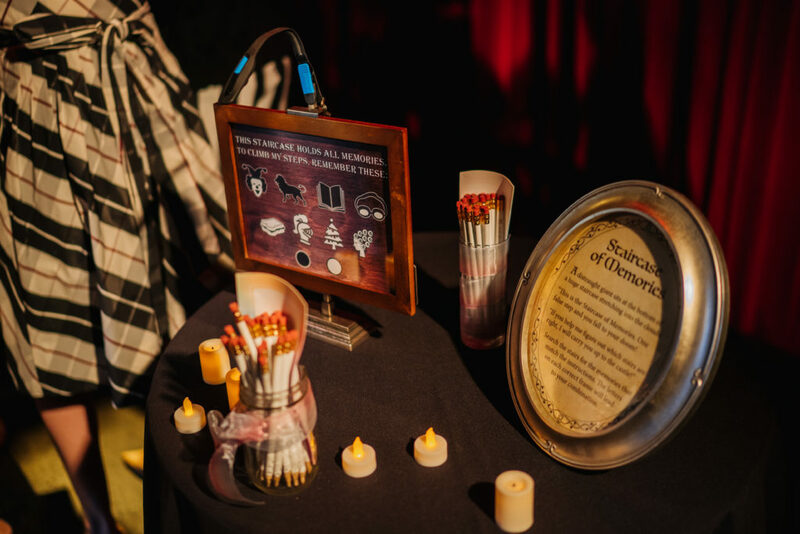 Fun thematic elements all over the place, plenty of crafts, many ways for our guests to be continuously delighted and engaged over the course of the evening. 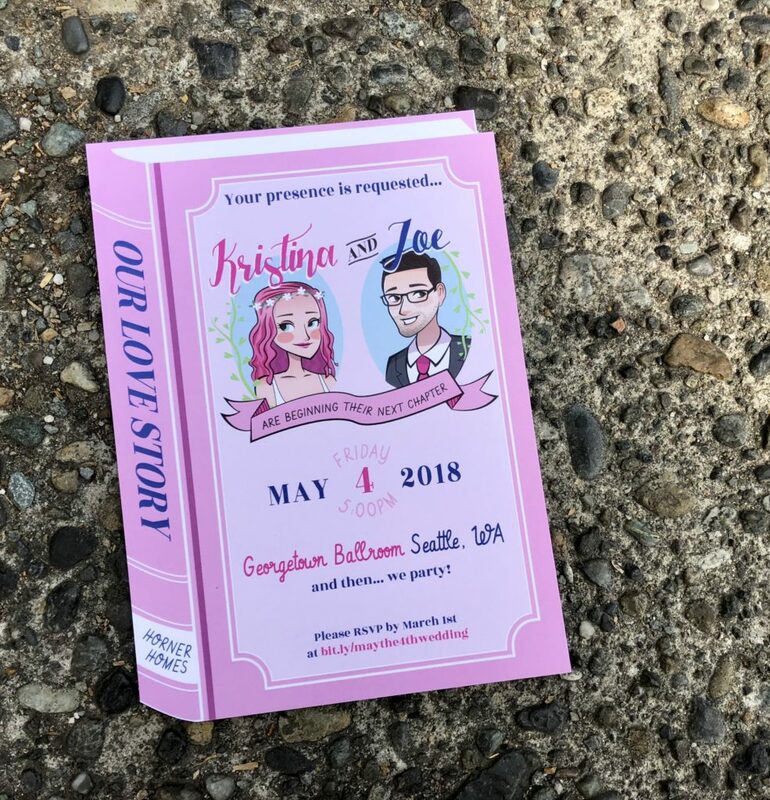 Good job, bride and groom, on an excellent wedding! …Have you met Joe and I? This wedding was just getting started. 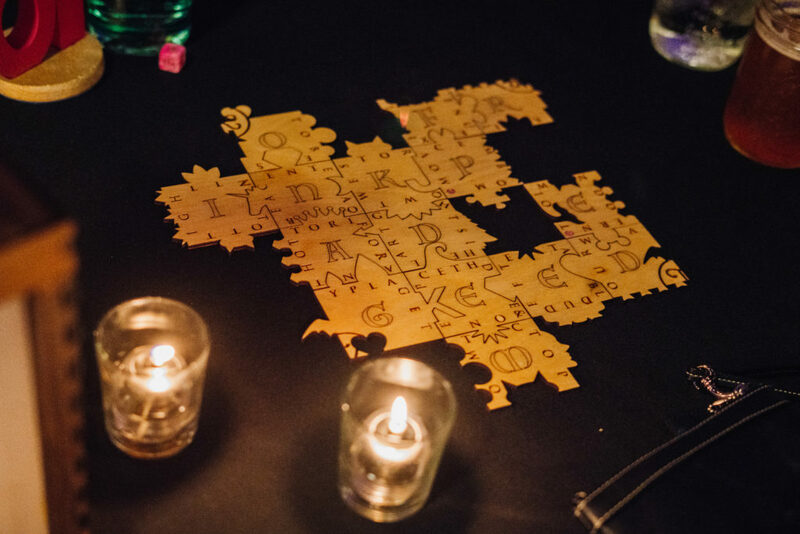 When our guests made their way to cocktail hour, they were greeted with this set of puzzle pieces. 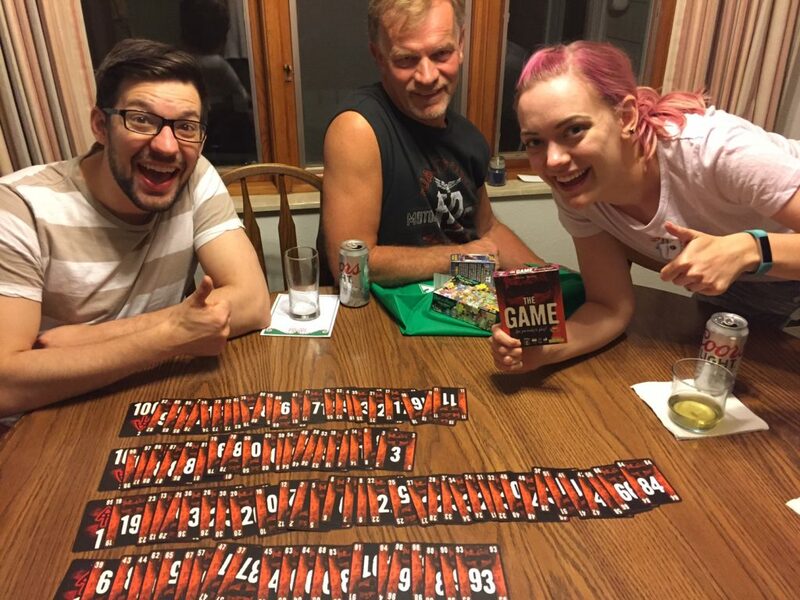 They were instructed to find their name, then take the puzzle piece with them to the table number they had been assigned to. Once they arrived at their table and met their other table mates, they would soon realize that their puzzle pieces went together, creating a larger puzzle with strange letters on it. If they had assembled the puzzle correctly, these letters would give them instructions. 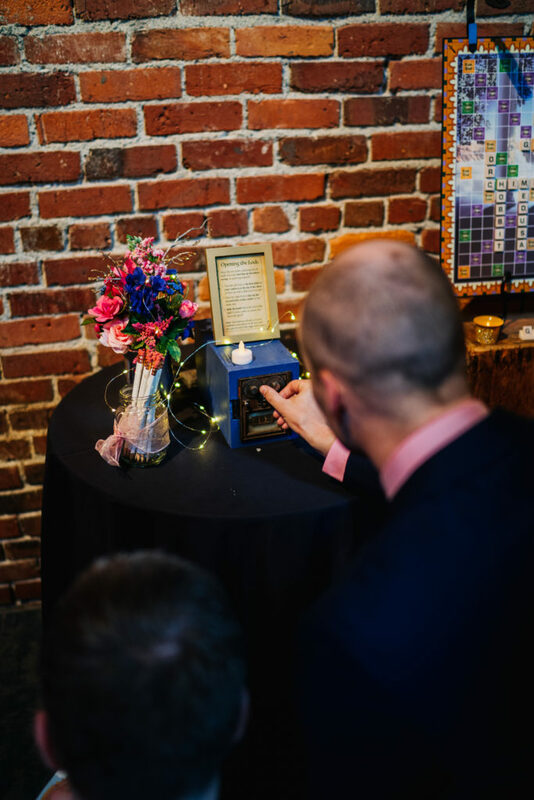 Following the instructions, which actually included deconstructing parts of the puzzle and putting it back together another way, gave guests additional instructions on how to use their seemingly innocuous table number to light up the random wooden box that had been on their table. Surprise! It was a lantern. I don’t have a photo of one lit up, but imagine it lights up. 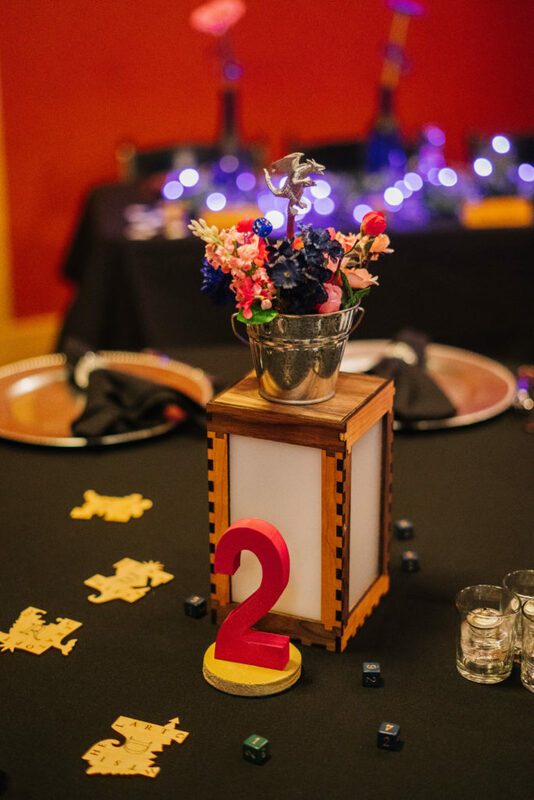 Then — if guests tried to lift the table number back off of the lanterns, they would find that they were magnetized, so this action would reveal a trick opening on top. Hidden inside the lantern (they were there all along!!) 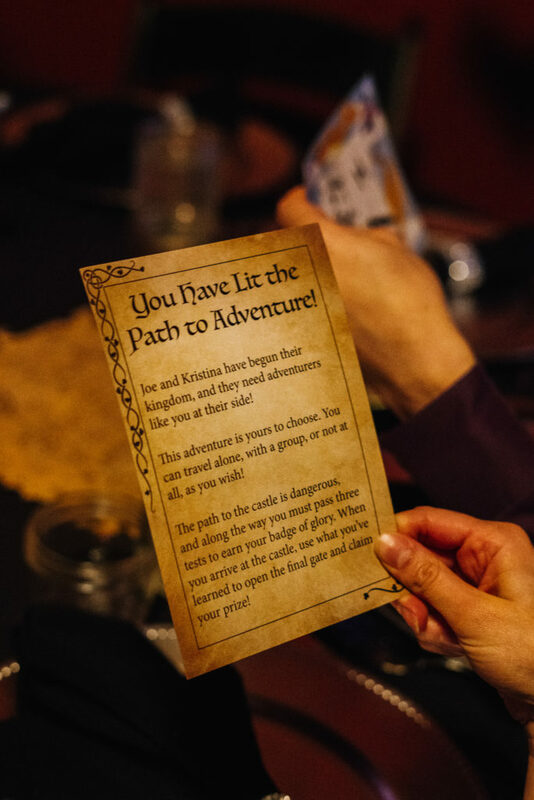 was a set of “quest logs”, which instructed guests to find a series of additional puzzles around the venue. Every table succeeded in lighting up their lanterns, and some people dropped off after that in favor of chatting and drinking. We expected this. A very large handful, however, took the next stage very seriously. Joe had created four ingenious stations with various kinds of puzzles to solve, each one sending each “adventurer” further along a storyline we’d created. They had to play a game against an invisible foe, assist a wizard with making a potion of courage, and help a giant up a tricky set of stairs. Each puzzle station gave them a code, which they’d then use to open a lockbox, which contained stickers for them to put on their quest logs. 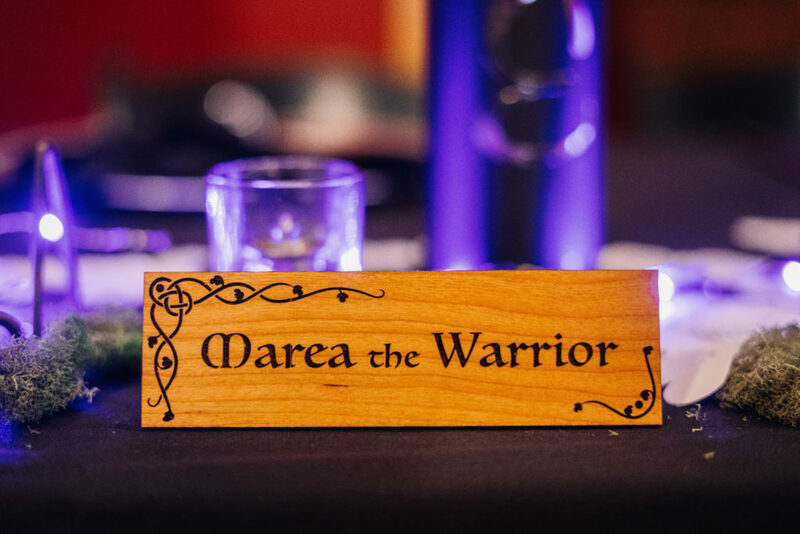 A completed quest log would have one final meta-puzzle to solve within in, which gave our guests the final code for the final lock box. 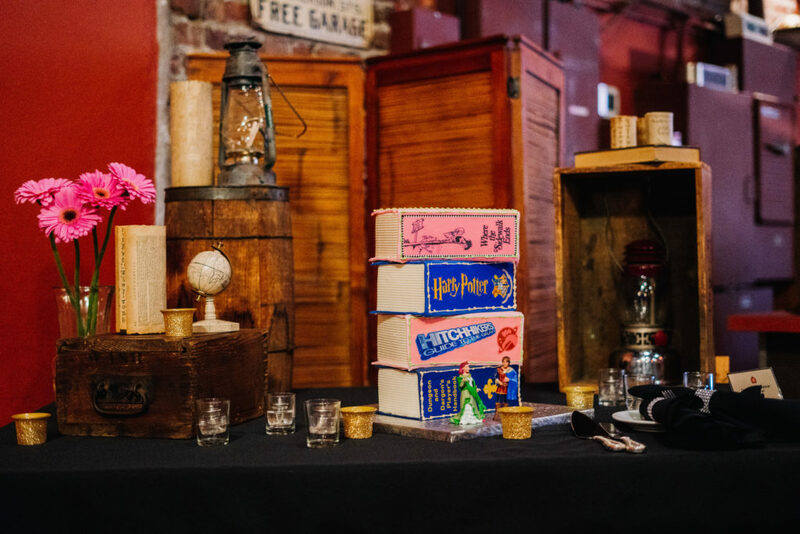 Once guests were able to open this final box (thus completing their adventure and arriving at the wedding of Queen Kristina and King Joe), they were able to take a wedding favor as their prize. The night happened in a blur. 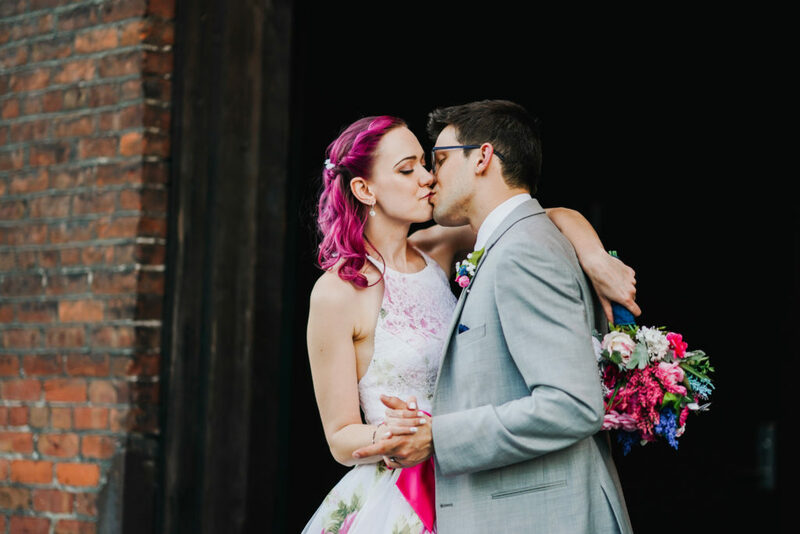 I am so, so thankful for our incredible photographer and videographer for capturing the event in such detail, because I hardly remember even being there. I do remember feeling incredibly happy — because I knew the whole experience was almost over, but also because the joy we could see on the faces of our family and friends made all the stress and work of the last year feel so completely worth it. This wedding would not have been possible without the incredible support of our friends and families. I cannot tell you how many hours of their time people gave us to make this as incredible as it turned out. I honestly don’t know why we have friends anymore at all. But apparently, they like us a lot, because they helped us pull off this ridiculous, gargantuan thing and they still want to hang out with us today. A lot of people say your wedding won’t be the best day of your life. That it won’t be the day you’re the most in love. That many things will go wrong, and that you’ll laugh, and you’ll have great stories, and you’ll move on and do many bigger and more important things with your life. 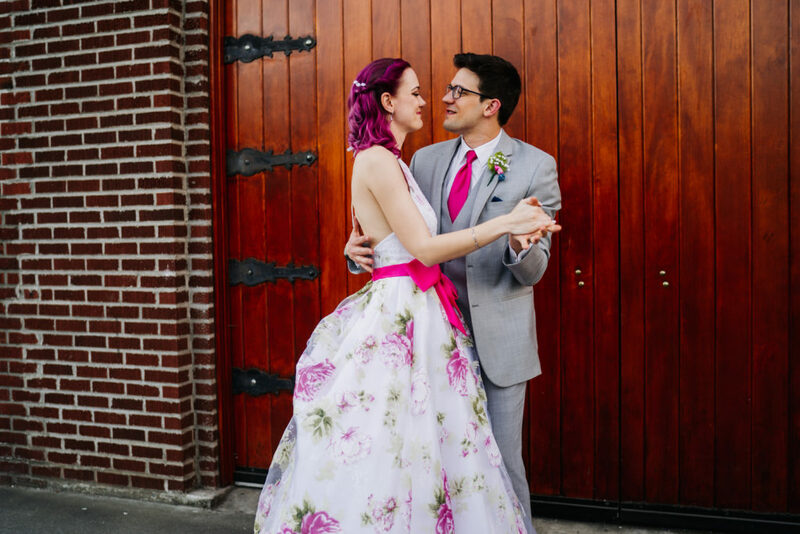 We had a pretty excellent wedding. 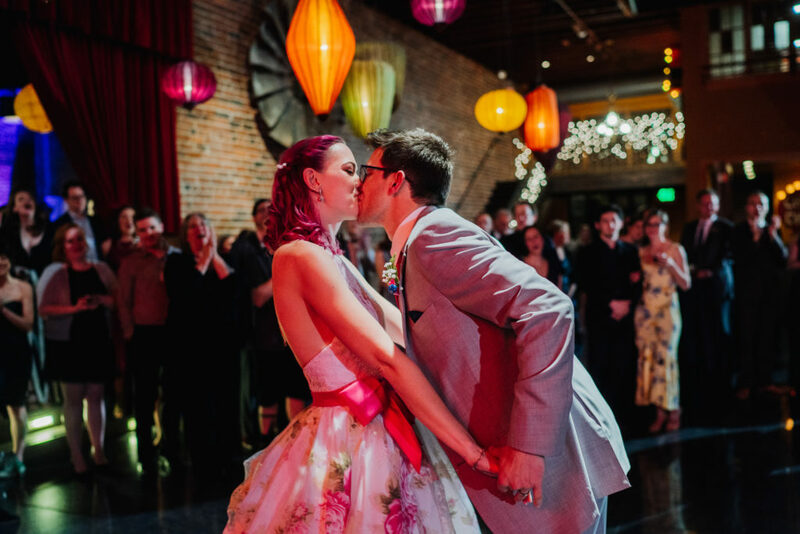 And I think for both of us, seeing the culmination of all the hard work we were both respectively putting in, for months, and how happy we’d made pretty much everyone we know… I think we fell in love all over again that night. I know there are amazing things on our horizon, and doing things like having children and creating a home together and growing old will definitely all be amazing things, and I know we’ll love each other a little more every day. 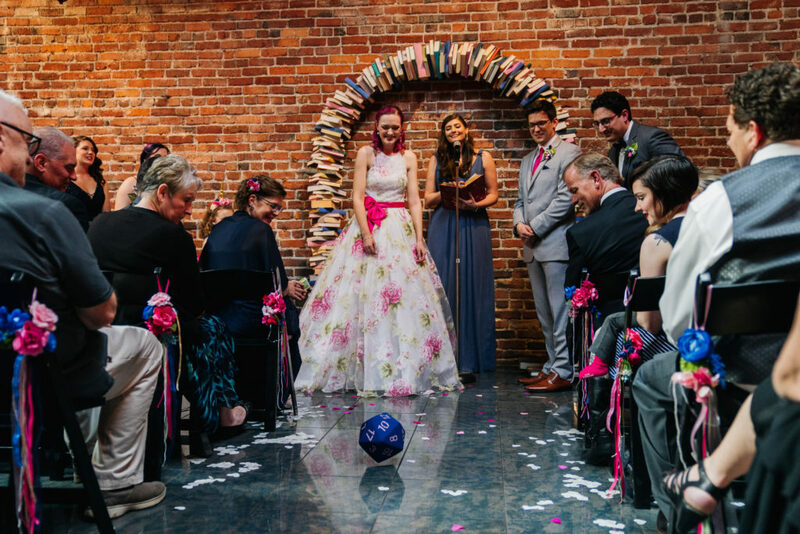 But our wedding was really, really goddamn cool. 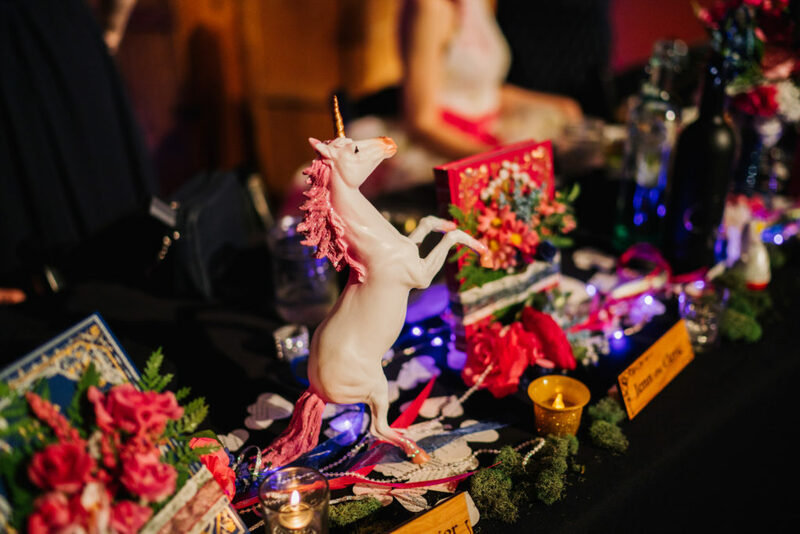 All I wanted – my mission statement throughout this entire process – was for people to say they’d never been to a wedding quite like ours before. I’m not exaggerating in the slightest when I say that was repeated to me, verbatim, at least fifty times over the course of that night. I’ve never smiled so hard in my whole life. 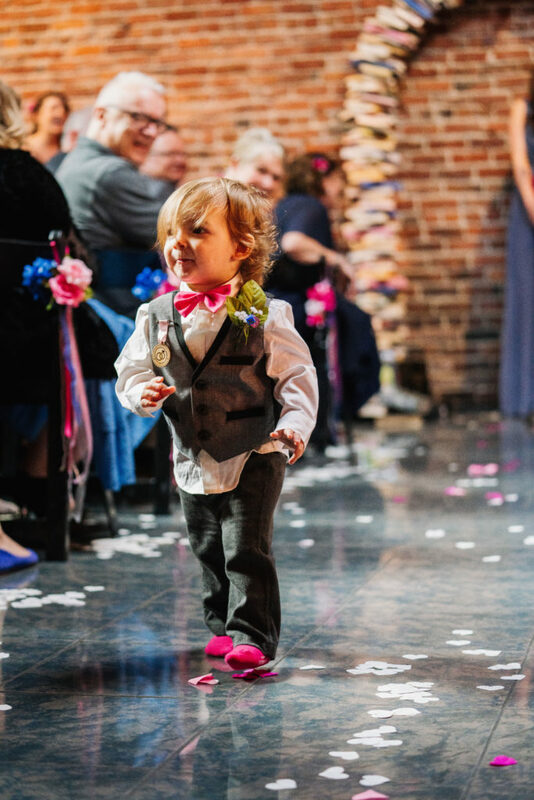 Even though this wedding made me crazy for many months… I wouldn’t change a thing. 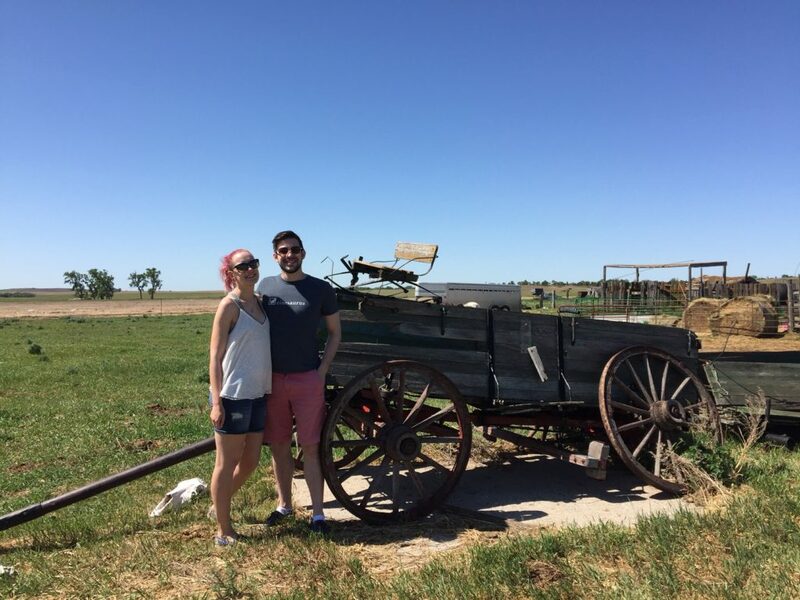 I recently got back from a little family trip to North Dakota, the purpose of which was to visit relatives and introduce Joe to future in-laws. 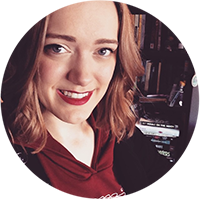 North Dakota is a really special place for me – it’s the state in which I was born, it’s where some of my relatives still live, it’s where my parents grew up, where my dad’s farm was, where our relatives settled when they came to the US… it’s also filled with food, language, traditions, and history that’s unique to my family, things that I fear will slowly fade away as people grow old, move away, or move on. As we grow more reliant on computers and chain restaurants and the internet and brands and phones, it’s natural that old traditions and habits slowly slip away, and it can be a very sad thing. One of my dreams is to write a book that captures and preserves some of this stuff. I don’t live in North Dakota. I’m not personally making the big life choices to help keep these small towns alive. I don’t cook North Dakota-German food as much as I could and I definitely am aware that each generation in my family knows significantly less of the low German language my family used to speak out on the prairie. So my way to contribute, my way to give back, is to collect stories. To collect anecdotes, and recipes, and ideas; to capture the lifestyle and write it into a book. Someday. Every time I visit I come back even more fired up about this plan, so I decided to finally tell someone, maybe as a way to hold myself accountable. It will happen. I owe it to myself. I’m obviously waist deep in a different book right now, but this one is always on the back burner. It’s in the back of my mind and I keep collecting notes and ideas and stories and recipes so that when I am ready to sit down and write it, I’ve already started doing the work. My future self will thank me. My future self will thank me. 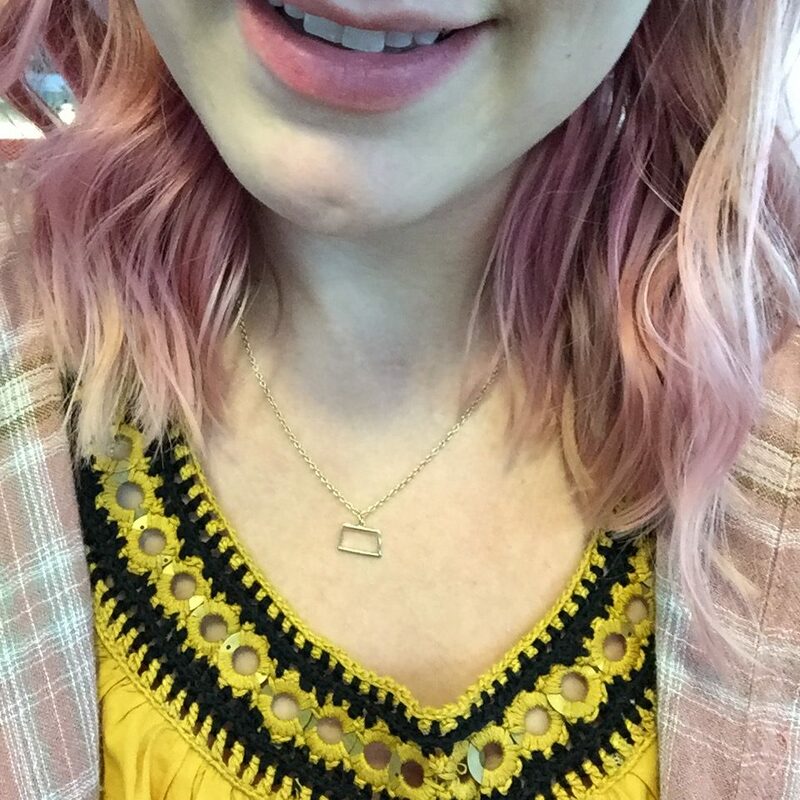 Side note: here’s the necklace I am wearing as I write this blog post about my birth state. Rather than spoil anyone on my unwritten future book, I’m just going to share a couple of pictures from my trip. It was a trip on the quieter side for my usually loud and rambunctious family – but we didn’t come during a holiday, so not as many people were around. I missed my other relatives, but it was nice to have quality time with my two grandmas, the two remaining grandparents I have. They both live in North Dakota, about an hour apart. This is my mom’s mom, the biggest firecracker of a lady you’ll ever meet. 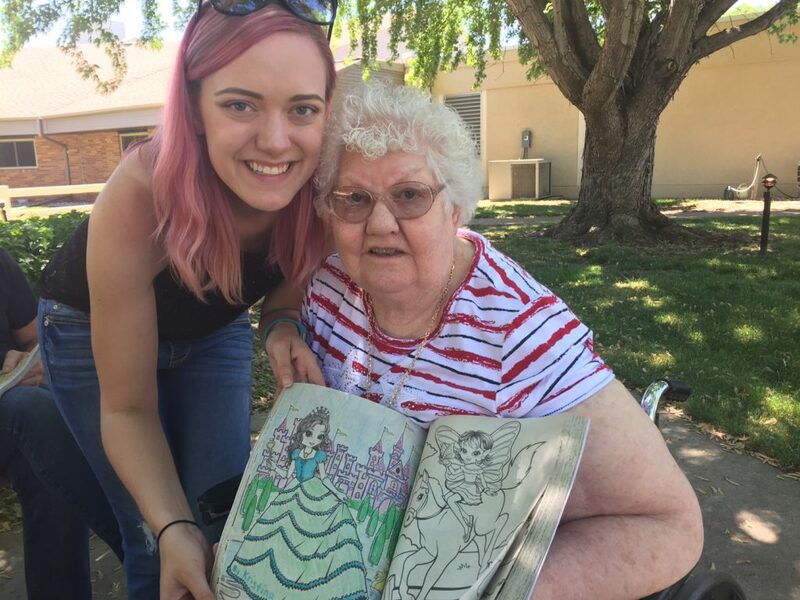 She’s taken to coloring lately to keep her mind and hands busy in her nursing home, so we made sure to stop in to color with her, among other things. 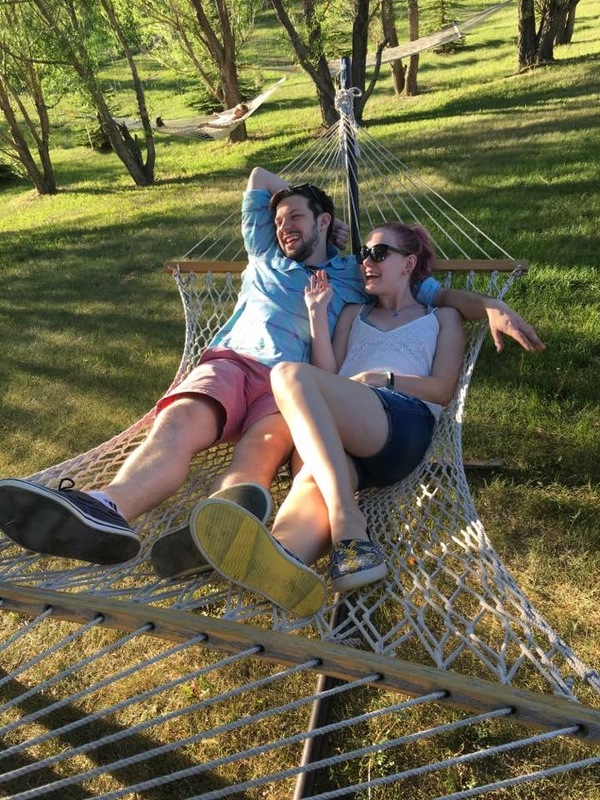 My aunt had a little BBQ at her beautiful home, and was happy to share with us her collection of hammocks. This was probably the part of our trip that felt the most like a vacation. These are two of my cousins’ cute kids. They gave me a tour of the entire property and even taught me how to pick asparagus from the garden. I’m not sure we were supposed to, but they seemed to think it was fine, ha. My dad’s cousins have a ton of property on which they keep a huge amount of the world’s remaining Nokota horses. It’s a pretty amazing story, actually. 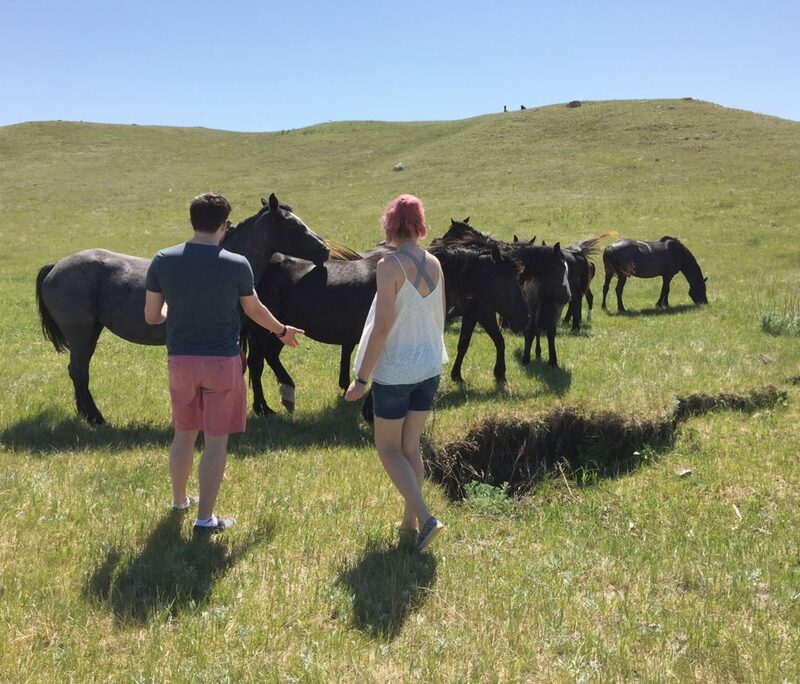 These horses are completely wild, and were on the brink of extinction before our relatives moved them here. It’s always such a treasure to get to go out and see them in person. I always love taking pictures by cool old stuff when I’m in North Dakota – in fact my dad likes to tell people the drive out to his old town takes “twice as long if Kristina is with, because she always makes us stop to take pictures of all the old barns that have fallen down”. Joe and I had to take an obligatory vacation photo by this old buggy, which is the very same one my great aunt and uncle used to give tourists rides on in a town about two hours away. They’ve both since passed away, but I fondly remember many rides in this buggy as a child. I’m pretty sure my parents used to give them $20 to drive my brother and I around in circles until they were done at the bar, haha. Playing card games at Grandma and Grandpa’s house has always been a staple of trips to ND. It’s very sad Grandpa isn’t around to play with us anymore, but we still always play in his honor. 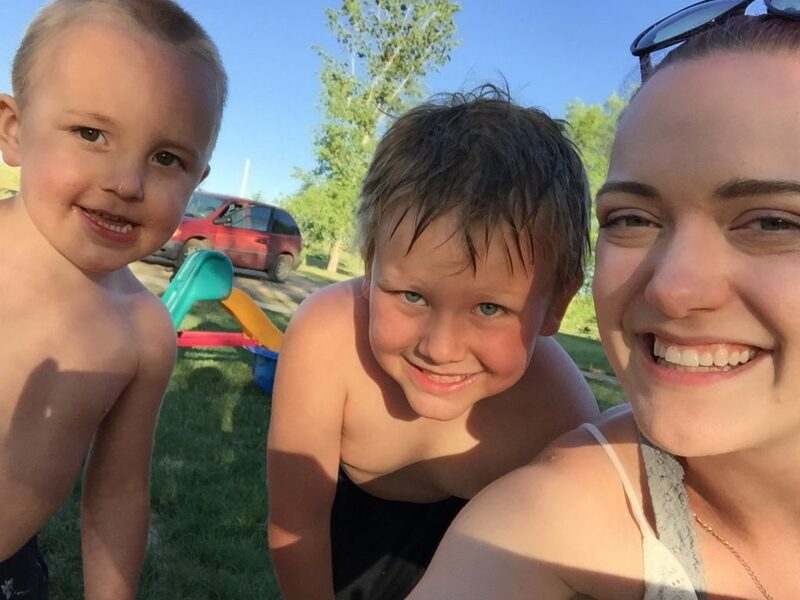 Our little trips to North Dakota don’t always look like much, but they mean everything to me. I’m so happy I get to share them with Joe now, and I’m excited to accompany his family to New York in a couple weeks to share the same kind of experience with him.